Take advantage of off-season flights to Grenada where you can increase your sailing skills and confidence whilst having fun in the sun. 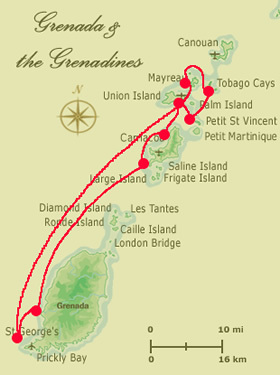 Our 7 day tour of the islands of Grenada, Carriacou, Union and the Tobago Cays includes glorious blue water sailing, great home-cooked food, fantastic snorkelling and evenings under the stars. Participate in sailing IBIS as much or as little as you like and let the wind blow away all your cares. Single travellers will make firm friends amongst their fellow boat buddies. Our itinerary takes in all the island highlights and gives you plenty of sailing, whilst allowing you time for relaxing and exploring. Diving trips can also be arranged to the incredible (if a little freaky) Underwater Sculpture Park and you might be lucky enough to see the nesting Leatherback turtles on a night watching trip. Need a bit more time? Why not combine your trip with the Grenada, Grenadines & Tobago Holiday or extend your stay to arrive a few days earlier or leave a little later and have extra time lazing on deck or gaining extra sailing miles. Arrival St George's& settle onto the boat; final provisioning, evening ashore in St George's. Sail to Dragon Bay for snorkelling amongst some amazing coral and continue on to Tyrrel Bay on Carriacou. Sundowners at the Angel's Rest and dinner ashore. Sail to the picturesque town of Hillsborough via Sandy Island where you can snorkel the reef in crystal clear water. On to Union Island to Check into the Grenadines. Sail to Mayreau which is rich in sea and bird life, including pelicans then on to the Tobago Cays, unrivalled for their speactacular natural beauty. Try swimming with the turtles. Barbeque dinner. Sail to Petit St Vincent, a quiet, unspoiled island that is part of The Grenadines. Picnic lunch on Mopion then time to wander ashore and see the traditional boat building before dinner. A leisurely sail back to Grenada and St George's Bay from where you can take a trip inland to the waterfalls and rain forest of Grenada. Optional night trip to watch the nesting turtles. Head into St George's for some souvenir hunting and say your goodbyes.